We have 10 days left. Can you help us get the word out? Everything we do in election season revolves around getting the word out about that site and getting people to go there and request their absentee ballots. In Japan we have done voter assistance tables, handed out cards and fliers, ran ads, promoted viral campaigns, and talked up VFA with pretty much every breathing moment. Phone banking, emailing, talking and more talking. So here is the horn tooting part-- Japan, not the largest committee or the largest population of overseas Americans by far-- is number 6 world wide for registrations using votefromabroad.org. #6!!! Just behind older, more established committees- UK, Canada, France, Germany and Italy. AND our sort of sister committee we've been helping in Beijing and Shanghai is #7! Done bragging now, and I return you to your regularly scheduled programming. With one reminder. If you know ANY American living overseas- point them to VoteFromAbroad.org today! 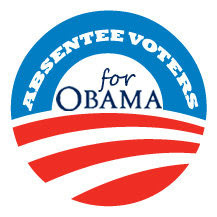 Our deadline for absentee requests is coming up in less than 10 days! Point them there. We'll take care of the rest. And don't forget you can also help by promoting our VFA Video with cameo by the gorgeous Gwyneth Paltrow.